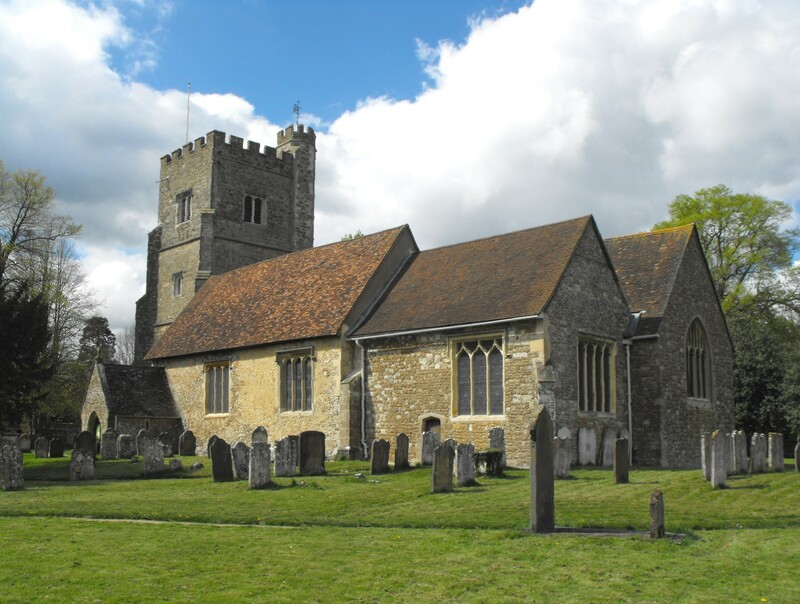 St. Michael's is attractively situated on the narrow upper greensand outcrop beneath the scarp of the North Downs. Both its plan and its origins are complex as the original church may be represented by the S. aisle, which begins from the second bay of the later, thirteenth century nave. It is independently-gabled and now adjoins the fourteenth century S. chapel, known as the Stanhope Chapel (as illustrated in the photograph above). Yet externally there is little evidence of the building's different stages of development since most features are renewed and only the late Perpendicular (Tudor) W. tower is of significant architectural value, rising in three stages to battlements, supported by diagonal buttresses and given dignity by an octagonal stair turret to the northeast, ascending in diminishing stages to project above the tower itself. The interior is of much greater interest. 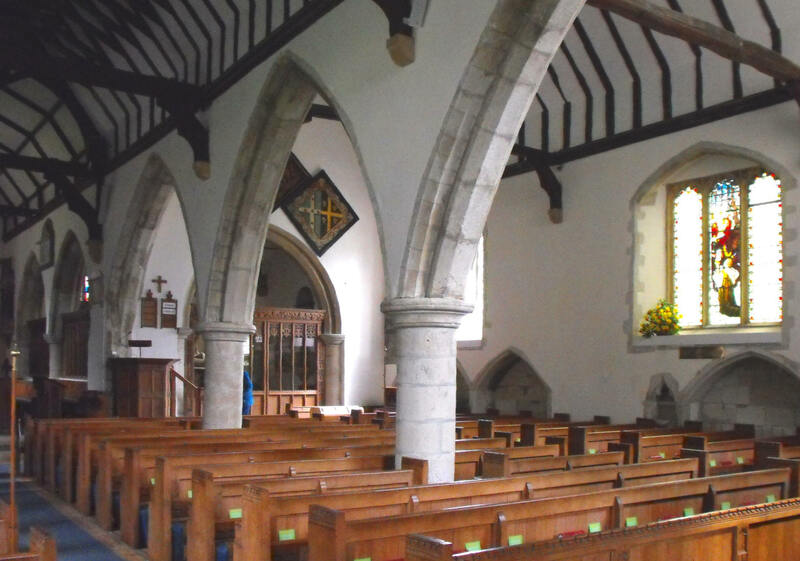 The three-bay aisle arcade is composed of double-flat-chamfered arches and circular piers with circular capitals (as shown above left), compatible with a date in the early thirteenth century, and yet the two-bay arcade between the chancel and fourteenth century chapel is similar. Still more intriguing is the discovery that the nave N. windows (which not only begin one bay west of the aisle arcade arches opposite but are entirely out of synchoronization with them) are set in large blocked arches bearing two narrow flat chamfers (see the easternmost arch, above right), whose original function is difficult to conceive. Quite clearly, they never constituted a "proper" arcade, but rather three individual arches separated by wall pieces. 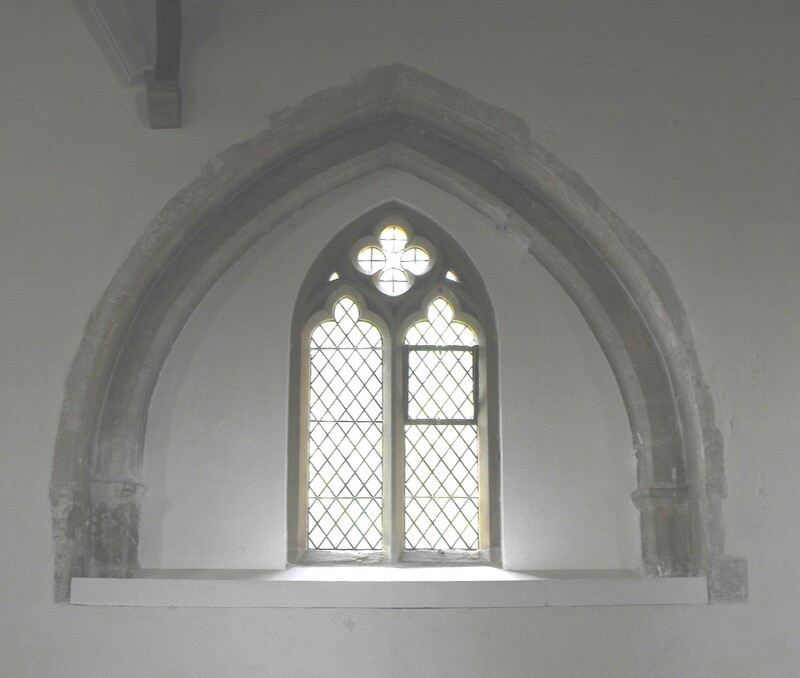 Were they simply intended to enhance the internal appearance of the windows, in which case then surely the latter were once of more impressive design, or could they have led to cross-gabled bays in the manner to be seen at Burrough Green, Cambridgeshire, perhaps serving as chapels? 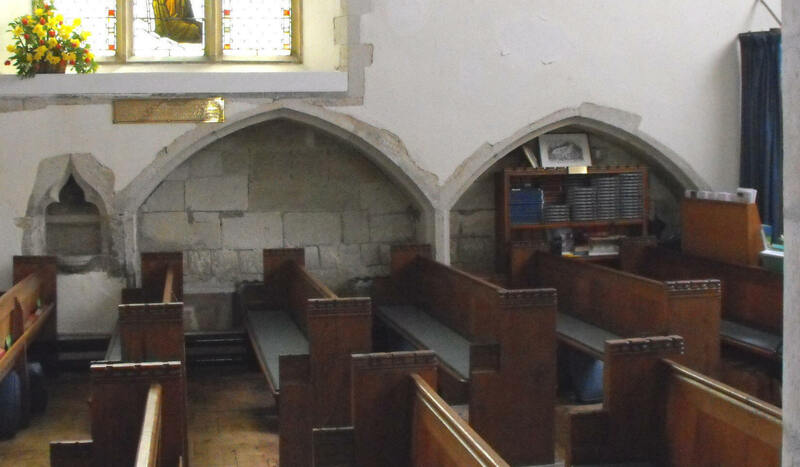 That may seem unlikely, yet there was a chapel further to the east, where a mediaeval arch now leads to the modern vestry, and recessed in the S. wall of the S. aisle opposite, there are two pairs of tomb canopies each followed by an ogee-pointed piscina (see the photograph of the western group, below left) which certainly implies there were two chapels here in the fourteenth century, presumably divided by a wall or a partition. These speculations aside, however, most visitors to the church will long since have gravitated to the monuments in the chancel and Stanhope chapel, one of which clearly rises above the rest. The oldest commemorates Sir John Lennard (d. 1591) and his wife Elizabeth, who lie straight-legged on a tomb-chest, Sir John in full armour. Pevsner believed his head was probably a portrait - a grand conceit at this date if it really is true. Larger than this but somewhat less competent is the monument to Samson Lennard (d. 1615) and his wife Margaret (shown above right), squashed in the northeast corner of the chapel, depicting the couple in effigy beneath a round coffered arch, with an achievement above and black obelisks at the corners. The supporters on the tomb chest represent the couple's five daughters (S. side) and three sons (N. side), although a fourth son may be missing. Self-evidently the monument was not intended to be backed against a screen. These monuments are unsigned, but in a class of its own is another in the chapel (above and below), signed on the back of the pillow by Sir Francis Chantrey (1781 - 1841), and reputedly the work of which he was most proud. (Rupert Gunnis, Dictionary of British Sculptors 1660- 1851, pub. The Abbey Library, 1951.) Dedicated to the memory of Lady Frederica Stanhope, who died in childbirth, aged twenty-two in 1823, it vividly evokes a subject considered too delicate for portrayal until the cult of sensibility had rendered it respectable. 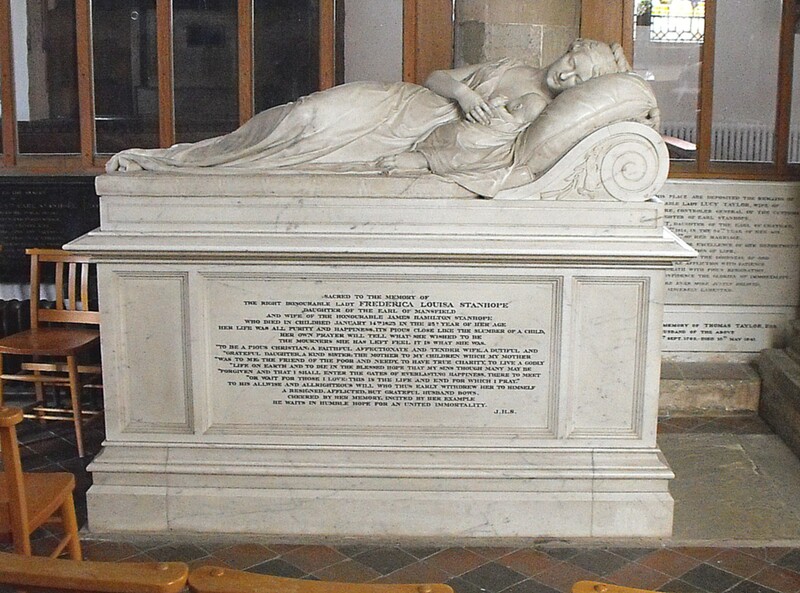 Eventually, by the early nineteenth century, it had actually become quite common (see also the monument to Princess Bariatinsky by John Bacon the Younger at Sherborne, Gloucestershire), but this is a particularly touching portrayal, depicting Lady Frederica sleeping peacefully with her baby at her breast.